I have received an email from Iqbal Academy UK informing me of something which I consider an honor. 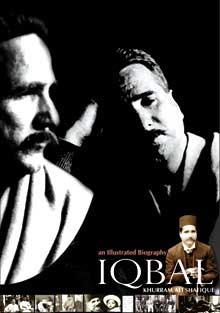 My book, Iqbal: an Illustrated Biography (2006), has been presented for inclusion in the Birthplace Library at Stratford-upon-Avon. The director of Shakespeare Birthplace Trust received it from a delegation which included chairperson of the Academy and the Lord Mayor of Birmingham. The love which I feel for Shakespeare is beyond words, therefore I feel a special joy at receiving this news. Following are relevant portions of the email sent to me by Dr. Saeed Akhtar Durrani, Chairman, Iqbal Academy UK, whose contribution towards retrieving the documents related to Iqbal from various places in Europe is especially noteworthy. On 5th June 09, a delegation led by me as the Chairman, Iqbal Academy (UK) and including the Lord Mayor of Birmingham, visited Dr Diana Owen, Director of the Shakespeare Birthplace Trust at Stratford upon Avon. We presented a copy of your illustrated book to her for the Birthplace Library. We also proposed that a suitable plaque, containing Iqbal's Ode to the Bard be installed at a suitable place. The Director graciously agreed to our proposal. Congratulations! This is a womderful achievement. He has learned well and teaches that: "The devil can cite Scripture for his purpose" and thus through the Igbal efforts - along with other writing and teaching - encourages all here and in class by word and example not to let "Our doubts (be our) traitors, and make us lose the good we oft might win, by fearing to attempt". Although he speaks English as good or better than any American and I would "dare say" as well as most Englishmen, he knows better than to copy the West nor to laud the same except where this may be well earned and enlarging of ideal. Thus with his discernment he has no need as did Caliban to say "You taught me language, and my profit on’ tis I know how to curse. The red plague rid you for learning me your language!" Khurram Ali Shafique Sahib's readers and students everywhere as well as his inspirations and work are most substantial -- unlike those who are "such stuff as dreams (along) are made on (who's) little life is rounded with sleep." Zubair, Structure of Entropy and Connie, thanks for your kind words and sharing my happiness.